The month of June signals the start of summer and the end of college graduation ceremonies. If they have not done so already, newly-minted alumni will soon make the transition from students at their universities to employees at the first companies that hires them. During the 2016-2017 school year, 1.9 million bachelor’s degrees are expected to be handed out, according to the National Center for Education Statistics. That is a quite a few people that will be looking for jobs after leaving their college campuses. 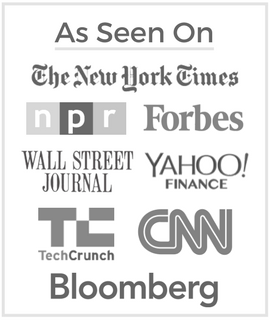 But, what exactly are the newest members of the U.S. workforce looking for in a job? LendEDU has commissioned polling data to find out what recent graduates desire when seeking employment. What Kind of Company Culture Do Recent Graduates Look for? The majority of respondents, 62 percent, said they would prefer to work in a “collaborative” work environment. The remaining 38 percent of poll participants said they would rather be a part of a “competitive” atmosphere. Interestingly, men were more prone to answering that they would rather work in a “competitive” workplace. 43 percent of men answered that they would prefer a “competitive” atmosphere, compared to just 34 percent of women. Furthermore, 66 percent of women said they would rather work in a “collaborative” workplace – more than the 57 percent of men who answered the same. Overall, 52 percent were in favor of working at a job with less job security, but more benefits. The remaining 48 percent liked the idea of being employed at a company with more job security and less perks. 58 percent of men were more interested in working at a company with less job security, which backs up the fact that more men wanted to work in a “competitive” environment. Only 46 percent of women, on the other hand, preferred employment at a place with less job security. Additionally, 54 percent of females wanted a job that offered more job security, compared to the 42 percent of men that optioned for a position with more job security. The fact that more men wanted to worked at a job with less security, but more benefits backs up the aforementioned data that showed more men preferred a competitive workplace when compared to women. When it comes to job-hunting, males are more willing to take a risk at a company where job security is not promised and competition is encouraged. Contrarily, females seem more prone to find a stable job where collaboration is put before competition. However, the next poll question may throw a tiny wrench into this theory. 69 percent of respondents answered that they would rather work for a “larger, more established company. When the question was broken down by gender, more men, 35 percent, said they would rather work for a small startup than the 28 percent of women who felt the same. Additionally, 72 percent of women would prefer working at a “larger, more established company,” compared to the 65 percent of males who wanted to work at larger company. Usually, startups are thought of as having a more collaborative environment. They usually have a small number of employees that all need to work together to grow the company. Meanwhile, competition is more prevalent in larger companies where employees need to differentiate themselves from the rest of the crowd in order to be promoted. That is why it was interesting to see that women were more in favor of working at a larger, more established company. Especially since the previous two questions seemed to indicate that men were more likely to prefer a less secure, competitive environment. That being said, startups are also less secure than larger companies and will usually offer more perks than the bigger workplaces. So, it would make sense that more men were willing to work at a startup because more men were also willing to take on a job with less security. What Do Recent Graduates Prioritize? Money, of Course! The next series of questions pertained to what college students desired most when choosing where to work after college. First and foremost, recent graduates want to make money out of college. “Good pay” received more votes than the other three choices combined by a wide margin of 45 percent. “Good pay” was expected to be the most selected answer, but it was not expected to blow away the other answers like it did. This poll indicates that college graduates only have their mind on the money, even though the other options could be just as valuable. If there was ever a time to make less money, it would be right out of college. The opportunity to make more money will always be there down the road, but a resume-boosting training program or a strong ethical culture that instills good values may not. College graduates clearly prioritize making money, but how much money are they expecting to make? The leading vote getter, “$40k to $60k per year,” received 36 percent of the vote. Following that answer, “under $40k per year” raked in 26 percent. It was interesting to see that all four choices were so tightly bunched together. Most college graduates should expect to see a salary between $40,000 and $60,000, so the plurality of respondents were on the right track. Additionally, many recent graduates could expect to see a salary under $40,000, which was the second most common answer. This poll question seems to indicate that graduates have a realistic grasp of their expected salary levels. 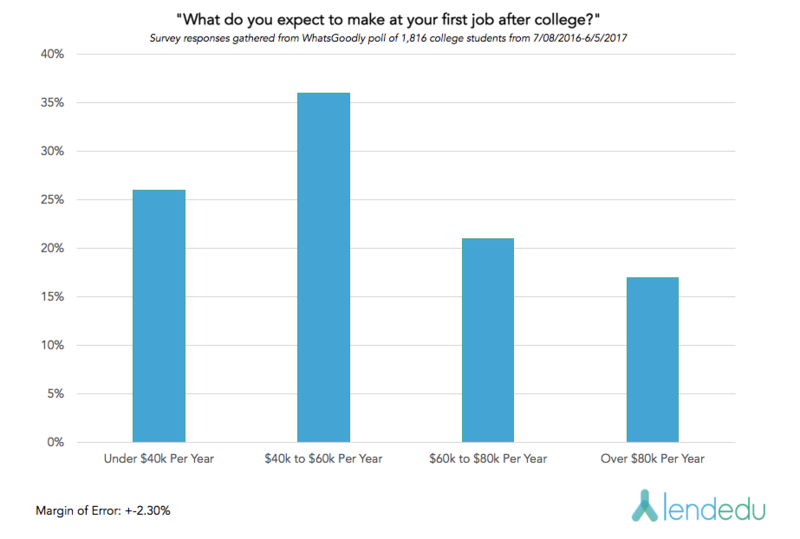 That being said, the 17 percent of respondents who are expecting to make over $80,000 out of college should begin tempering their expectations so they are not as disappointed. Very few college graduates will make that salary in their first job out of college. 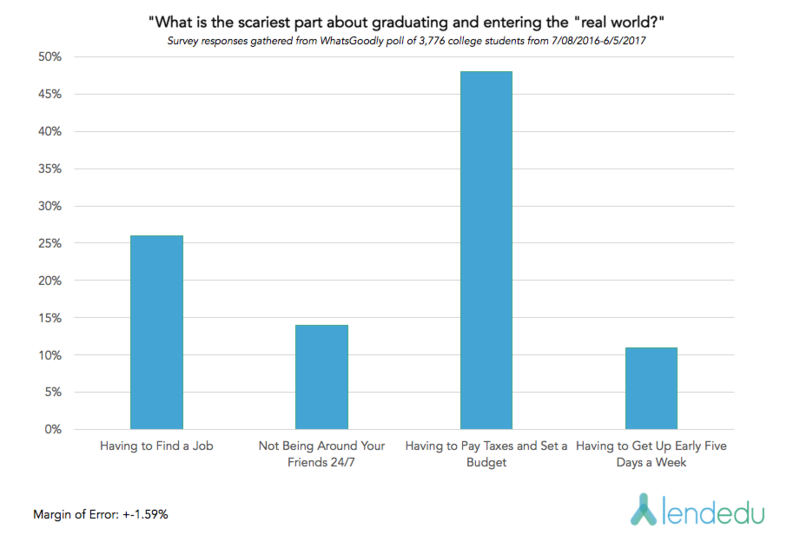 What Are Recent College Graduates Most Afraid of After Graduating College? The plurality of respondents, or 48 percent, answered that “having to pay taxes and set a budget” is the thing that terrifies them the most. 26 percent stated that “having to find a job” worries them the most. Another 14 percent thought “not being around your friends 24/7” was the scariest part about graduating college. The fact that the most common response amongst college students was “having to pay taxes and set a budget” backs up a previous poll ﻿commissioned﻿ by LendEDU. The poll mentioned above had asked 500 college students a variety of questions having to do with financial aid awareness. The results of this poll were somewhat disheartening, as many respondents did not know basic information regarding their finances. Whether it is their fault or the education system’s fault, students have a serious lack of knowledge when it comes to financial literacy, so it would make sense that they are most afraid of paying taxes and budgeting. LendEDU has commissioned the polling data used in this study from polling company Whatsgoodly. Each of the six questions used in this study had polled from July 8th, 2016 to June 5th, 2017. In total, 3,617 college students were polled for the first question. For the second question, 1,808 college students were polled. For the third question, 3,103 college students were polled. For the fourth question, 3,617 college students were polled. For the fifth question, 1,816 college students were polled. For the sixth question, 3,776 college students were polled.